Ok, I have had a look through the forum archives to see what is available and I don't think I have quite found the answer yet. I am looking to upgrade the front brakes (initially) on my car from the current set up. 3) Are EBC green stuff pads available for the current caliper? I don't want to spend fortunes on brand new calipers etc at this stage, but I was planning on changing discs to vented, new fluid, EBC Green Stuff pads and perhaps St.St. flexi's as a first step. If there are some donor calipers that would fit then I would look at these also. The easiest upgrade would be to MGF/Metro GTI vented discs and calipers. They remain 240mm but are vented. Your current wheels should still fit, if not no more than a 3-5mm spacer would be required. Are you changing the brakes because you've exceeded their capabilities? I ask only because you'll be increasing your unsprung weight by adding bigger discs/calipers etc. No, it's not so much me exceeding their capability, it's just that they feel really poor by comparison to my friends GTM that is running a vented disc and a similar looking caliper to mine (so I'm guessing it must be the Metro GTI kit?). To look at his car I hadn't even noticed his brakes were different. Then I drove the car a short distance and the difference was immediately noticeable. Perhaps it is more down to a a problem with the current set up and I could change pads, renew fluid, fit some st.st. brake lines and it would improve. I get (and agree) what you are saying ref unsprung weight....but having little confidence in the brakes doesn't make for a pleasant road car so I think I would gladly trade that off. By changing to vented discs won't make them more effective, only less likely to over heat and fade. Braided hoses may make the pedal feel a little better. If the brakes are bad then I would be checking the whole system out inc MC and servo, change fluid etc. Not being massively helpful but I was really disappointed with the power of my brakes in my K3 until I did a back to back distance test with my old focus. The brakes on the focus had far more of an initial bite and could felt they could throw you through the screen because of this, but when doing a 60-0 stopping test (on a closed road...) the K3 stopped about 10m earlier even though the stop felt less severe. I do have vented front discs but this wont help with power, only fade as roger mentioned. There is also less servo assist on my K3 needing more pedal force for the same stopping power which also adds to the perspective of "worse brakes". New, sportier pads should give you more of an initial bite, but if you do have a car to compare against it, I would give it ago as I was pretty surprised! When I picked up my K3 and drove it back from Taunton the brakes were nothing short of scary, I found out during the rebuild that the servo wasn't working and is now however I decided to make my own brake pedal with better ratio as the original was 2.9:1 so I increased it to 3.7:1. It goes for MOT next week so I will let you know how it feels. It also has the MGF front brakes with vented discs and sliding calipers. Thanks to all for your input. I guess a good starting point is to check over what I have now and make sure everything is working, although the car does seem to be in pretty good order. I've had someone offer me a set of MGF calipers, new vented discs, fluid and a seal kit for a good price. Might be worth getting it anyway and if I don't need it I can always pass it on. I'm interested in your pedal box mod....do we all have the same pedal box or was there options on the donor cars? Pedal box was from a metro on all K3's with cable clutch. I modified the pivot point on the bracket by a few mm and added a clutch master cylinder while I was at it. I'm hoping for an improvement. Well it passed the MOT with slight imbalance on the rear wheels, near side was a bit tight but will ride up with wear! Brakes feel way better than before, I can now lock up if I want without needing two feet on the pedal as before. They should improve further as it gets used. Paul, see my drawing of the pedal arrangement, the black dotted line is the original geometry taken from the car, the pedal ratio was 2.9:1, 170mm pedal with 58mm from pivot point to master cylinder. By drilling the pivot hole back by 10mm and down by 5mm and making a new brake pedal at 3.7:1, 185mm pedal with 50mm from pivot to master cylinder it has resulted in less effort required and better brake performance. I considered that the chopped down original pedals were the problem so that was my reasoning behind the change. 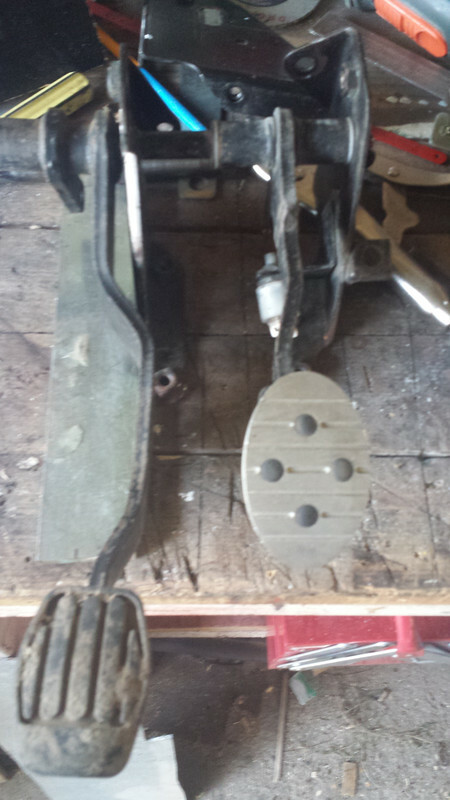 I considered that the chopped down original pedals were the problem so that was my reasoning behind the change. Last edited by catsam on Wed Oct 17, 2018 10:26 am, edited 3 times in total.